The BIPRO-S600VF12 is an outdoor CCTV camera with infrared video surveillance that can output high-resolution 960H analog video or high definition 1080p video. Installers can easily switch the video output between standard CCTV resolution and analog high definition (AHD) resolution at full 1080p. The split glass technology of the lens cover prevents undesired reflections in both day and IR night vision modes. The S600VF12 comes with 42 IR LEDs which deliver an infrared surveillance illumination distance of up to 200 feet (when set to "high") in complete darkness. Furthermore, this camera is equipped with a varifocal lens of 2.8 - 12mm providing a wide angle view. The advantage of the Varifocal lens is that the viewing field can be "manually zoomed in" to focus on a distant target area. The S600VF12 comes with a weatherproof rating of IP66, which ensures that it will hold up in harsh outdoor conditions, making this perfect wide angle weather-resistant outdoor camera. 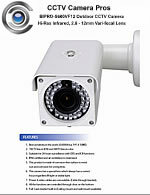 Click here to see this camera used in a business and home surveillance system installation. You can also watch sample surveillance video recorded from this camera here and see some video snapshot samples here. The cable through bracket design conceals and protects the power and video cables by keeping any extra cabling protected inside the bracket. The full 3 axis bracket design allows for easy ceiling or wall mount and customizing where you need to direct the lens for monitoring. The bullet surveillance camera gives users access to an on-screen display (OSD) menu to adjust the camera settings to exactly match your monitoring application. The on-screen display controls are accessed on the underside of the camera in a weatherproof compartment. If you require a more powerful varifocal lens (6 to 50mm) and stronger infrared beam for illumination up to 250 feet, please consider the BIPRO-S700VF50 outdoor bullet camera. This camera is dual resolution. It can be set to 960H resolution for use with analog CCTV DVRs or 1080p resolution for use with AHD (analog high definition) DVRs. By default, the resolution is set to 1080p AHD at the factory. You can set the resolution by accessing the OSD joystick in the camera's under-compartment. If the resolution does not change after holding left or right for three seconds, please repeat. This first video demonstrated the cameras analog 960H analog resolution mode that is used with traditional CCTV DVRs. It demonstrates the normal light, low light, and zero light infrared video surveillance capability of the BIPRO-S600VF12. The camera used in this video is mounted in the far corner of the room at nine feet high. The size of the room is 28 feet by 29 feet, and the door is 36 feet away from the camera. The floor lamp is the only source of light for the low light video test and it has a 15 watt light bulb in it. We tested the BIPRO-S600VF12 indoors even though it is an outdoor security camera so that we could create a true zero light environment to test in. This video was created by selecting the camera's 1080p HD video mode and connecting it to a 1080p AHD CCTV DVR. Important Note: Click the gear icon in the lower right of the video player and select 1080p resolution. Here are a few sample surveillance images that we captured using the BIRPRO-S600VF12. The above image was captured with all of the lights turned on in the room. The camera captured surveillance video in color when in daytime mode. This is a low light image. The only light source in the room is the floor lamp which has a 15 watt light bulb. The camera's infrared mode is engaged. This image shows the camera's capability in a zero light environment. The camera's infrared mode is engaged. These images were captured with the camera running in 1080p HD mode and connected to an AHD surveillance DVR. Please click on the images to see the full 1080p resolution photo. This image shows the camera's capability in a zero light environment. We tested this outdoor camera inside the office so that we could create a true zero light environment. The camera's infrared mode is engaged. The S600VF12 surveillance camera gives installers access to an advanced on-screen display (OSD controls) that is controlled using buttons within the under-body compartment of the camera. The OSD allows users to set the camera's color, light sensitivity, and other advanced settings to get the camera to perform exactly as needed for the specific installation purpose. CCTV Camera Pros has several BIPRO-S600VF12 cameras installed at our warehouse in West Palm Beach, Florida. Click on the below images to see larger views of this business installation. These pictures show the BIPRO-S600VF12 installed as part of a home surveillance system. This camera is mounted on Mike's house (CCTV Camera Pros co-founder). Mike mounted the camera to an electrical junction box because he switches the cameras at his house our pretty often for QA testing. Most home installations would not use such a large junction box. Typically the camera would be mounted directly to the wall of the home (as seen above in the warehouse install). The BIPRO-S600VF12 seen here is set at the widest lens angle to capture an overview of most of Mike's backyard. I purchased 6 of these to replace existing 650 TVL cameras that the IR had burned out. The picture quality is simply amazing! These are by far the best analog cameras I have ever seen. Full color at night with no IR LED's on and very, very low light. I paid about the same price for the old cameras 3 years ago. Wish I had found this camera then! This camera works GREAT !! Adjustable lens and IR. Doesn't even go into IR mode with a little ambient light.